Info "Be the most popular person at the party!" All Shook Up is a microgame from WarioWare: Smooth Moves. It is played with "The Remote Control" form and appears in Ashley's stage. 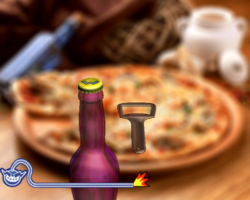 During this microgame, the player must open up soda bottles. This is done by pointing at a bottle and flicking the Wii Remote up to open them. 1st level difficulty: Open one bottle. 2nd level difficulty: Open two bottles. 3rd level difficulty: Open three bottles. This page was last edited on February 20, 2018, at 00:57.